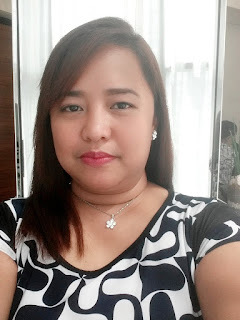 Do Filipino mothers really know best? Filipino mothers are known to have some of the world’s cleanest practices in running their households. They ensure their kids take a bath everyday and shower before going to bed. They hand wash clothes so that they are stain-free and smelling fresh for their family’s use. And they encourage their children to brush their teeth three times a day. However, because of the many chores and costs that come with maintaining the home, mothers are sometimes forced to improvise or maximize consumption of certain household products. For example, some mothers use leftover laundry soap to wash their plates. They think in this process they are saving up, but unknown to them are the horrors behind this practice. A recent study reveals that ten out of ten Filipino households who use bar solution consisting of used laundry soap, water and a sponge clean their plates with bar solution dirtier than a toilet seat cover. This data was obtained from a study conducted by a third party agency and an expert from the Philippine Society for Microbiology among 150 households who use bar solution. 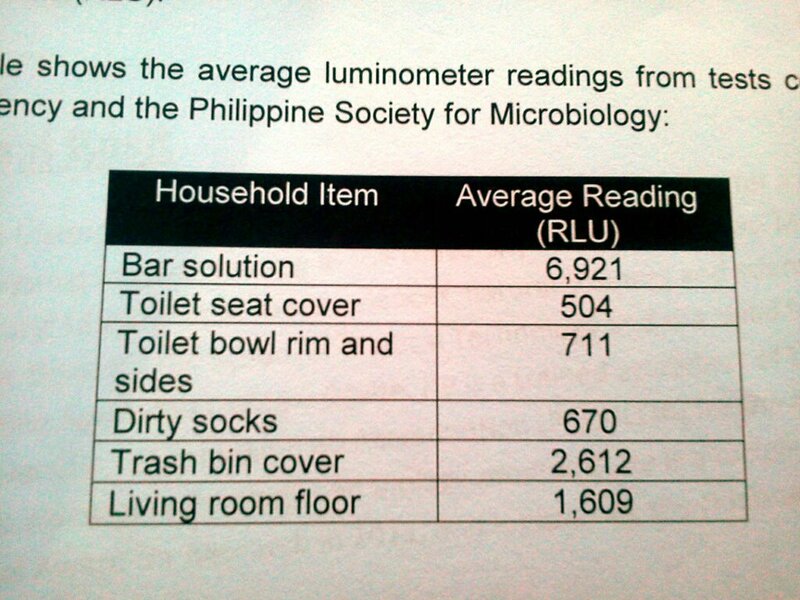 Using a luminometer or germ meter, the PSM found that all of the bar solutions have higher level of contaminants compared to toilet seat covers. The luminometer or germ meter is a device used by microbiologists to measure the levels of contaminants found in objects. This is done by swabbing on item’s surface with a chemical reagent (Luciferase/Luciferin), which causes a bioluminescent reaction that can be measured in Relative Light Units (RLU). The generated number of light emitted is directly proportional to the level of contaminants found in the object. 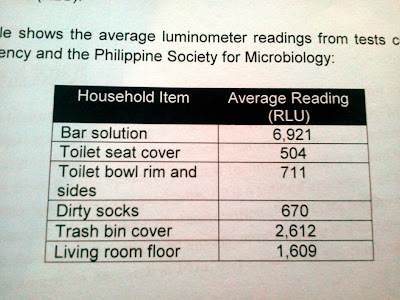 In this study, the germ meter’s reading was at 504 RLU for the toilet seat cover. The bar solutions, on the other hand, registered an alarming average of 6,921 RLU – 13 times higher than the toilet seat cover! With this result, mothers are better off preparing their family’s meals on top of their toilets’ seat covers than on plates washed with a bar solution. Commissioned by Joy Anti-bac with the Power of Safeguard and verified by the Philippine Society for Microbiology, this study aims to prompt mothers to reassess their current kitchen sanitation practices. “Every time a sponge is used it absorbs almost any particle or liquid it comes in contact with including germs from dishwashing. Likewise, the laundry bar that was once used to wash our dirty clothes also tends to collect dirt and particle especially when left in a moist container and exposed to open air. Together, these two become breeding grounds for contaminants,” explains Dr. Supachai Basit, PSM President. Joy recently launched a new variant, Joy Anti-bac now with the Power of Safeguard that mothers can trust. It not only cuts through grease, it also provides 99.9% germ protection so moms can stop cleaning with germs and keep their family protected. I was really surprised when I learned about this. I guess with the hope of saving, we end up risking our family's health.